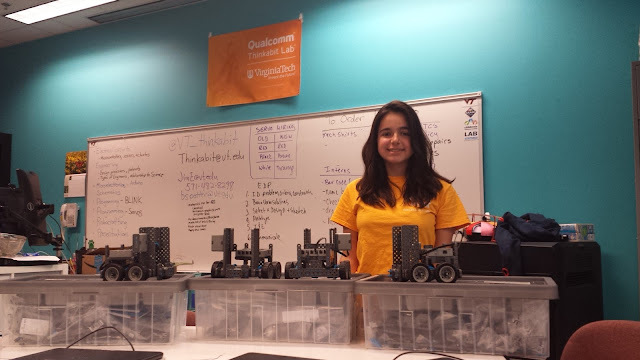 One of our excellent George Mason High School interns, Camile Borja, asked to lead our new VEX IQ workshops as a continuation of our Spring 2017 creative robotics and IOT/SmartCities program. Camile is an experienced builder, and she comfortably created the curriculum and environment for visiting 7th graders (and a 4th grader with a few adults) to explore this platform increasingly common in middle schools and high schools. Camile also embraced our emphasis on sensors-driven robotics supporting our IOT/SmartCities Thinkabit Lab initiatives. While driver-controlled robots (remote operated vehicles) are fun and the focus of regional competitions, the programming, computational thinking, logic-driven strategies, and sensor-actuator actions and data collection are arguably the most important outcomes in school-age robotics program in consideration of our future technical workforce. These creative robotics programs are expected to be featured in all of our 2017 Summer Camps.